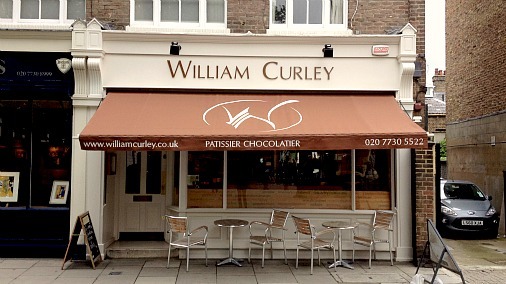 Sitting in his beautiful flagship store on Ebury Street, I talked chocolate, Michelin-starred pastry kitchens and future plans with William Curley. Cat Black: Tell me a little bit about the beginning of your career, how you got started. 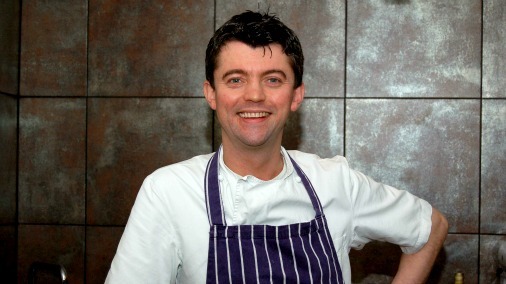 William Curley: I left school, with no real direction and ended up at a local technical college when I was 15. I come from a small town in Fife called Methil. My father was a docker, my mother worked for British Gas. My grandmother worked in a private house, where she did a lot of baking. We used to always go there for Sunday afternoon tea. I have really good memories of that. When it came to technical college there were three choices, woodwork, metalwork and cooking. And cooking was clearly for the girls! But I wanted to join in! I always remember on that first day, we made real butter shortbread and little bounty bars. We made them and we sold them, for about 5p each. I loved that course, so I enrolled in the City and Guilds course at Glenrothes, which covered everything. I especially enjoyed the baking side of it. I took a bit of a shine to that. And I used to work part time in a little local restaurant. In that type of place the lowest common denominator often does the desserts, and I was so happy and thrilled to do that. The chap who I worked with there had a friend of a friend, it is always a little bit like that, and he knew someone at Gleneagles. So through that, around 1989, I got an apprenticeship at Gleneagles. CB: So you found yourself part of a really impressive outfit. WC: Absolutely. There were about thirteen or fourteen guys in the pastry kitchen. 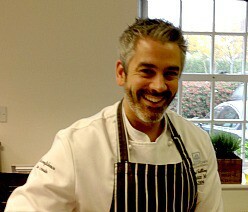 The pastry chef was a chap called Ian Ironside, who was quite instrumental in my development. Ian had worked with the Roux brothers for many years and had been a chef at the Savoy. He was very old school, which was probably very good for me, because I can be quite cheeky. CB: He gave you boundaries. WC: Aye, you knew where you could go and you knew where you couldn’t go. It was quite a pastry kitchen, all the sections. There were tourier, afternoon teas, petit fours, some chocolate, a little craft room and obviously desserts for the different restaurants, banqueting and the private rooms. CB: So because it was on a grand scale, you saw everything broken down into its special components. WC: Yes, there was even an ice cream and sorbet area, and for the first time I saw it all broken down. There were things I had never seen. It was like there were jobs within jobs. I thought it was fascinating. I spent three years there learning my craft and I really enjoyed it. I arrived at Gleneagles with ambitions to become a chef. I achieved some of that, with local competitions, and I went and did a few courses at Glasgow Food Tech on my days off. I did an advanced pastry course, and became much more rounded. An early talent for pastry has reached the ultimate refinement. When I left I didn’t really know where to go. But I read White Heat, by Marco Pierre White, and I thought; wow, this is so rock and roll! CB: He was very rock and roll. WC: He kept talking about working 18 hours. We were doing 15 hours a day. So I thought, what’s the difference, I can do that. I bought a Michelin guide, and decided I was going to go to France. I decided I would only go to three star places. I wrote off, not really knowing what it was about, but I had heard those were the best places in the world to go and work. I wrote sixteen letters, hand written, in English. I got one response, from which I worked out two lines with a ‘non’. I had to revert to plan B. I knew somebody, who knew somebody, who got me a stage, which turned into a whole summer, working at the three-starred Maison du Bouche just outside Brussels. It totally transformed me. In a place like Gleneagles, even though it is really good, they are doing a banquet for two hundred, a private dinner for fifty. CB: That dictates its own limitations. WC: Totally, and there is a price point there. But when you start getting into two or three Michelin-starred food, there is very little compromise. It opened my eyes. I was absolutely blown away by it. I think they paid me hardly anything, but they gave me accommodation. It is funny, when you are very young, and you have no outgoings as such, and you get paid a pittance, but they give you accommodation and they feed you, it feels like masses. CB: The world is your oyster. WC: After Belgium I spent two years working for Pierre (Koffmann) at La Tante Claire. He opened the doors for me in many ways. I went there as the commis but left as his pastry chef. That time was big for me. When I was there Gordon (Ramsay) was there, Marcus (Wareing) was there. CB: Some very passionate people working alongside you. WC: We were working crazy hours! I have pictures of me looking haunted. I used to do crazy things like wake up on a Saturday, on my day off, and go and do a stage somewhere. CB: You were hungry for it. WC: I just wanted to keep feeding for information. You can only do it for a certain period. Gordon gave me a good piece of advice then. He said that as a profession, even if you work in an average place, you would still have to work maybe 12 hours a day. So to work 16 hours, just that little bit extra, you can work in the absolute best. It is a no-brainer. In some ways that was the best part of cooking, working in a team, all young and hungry, it was a great journey. But you get older, and you realise that either your body can’t take working like that, or you have your own restaurant and you can control it. For me my shops are my restaurants. William's flagship store on Ebury Street, London. CB: And the need to do that is during the period of time when you are setting yourself up. WC: You feed off your ambition, it gives you energy, while you are setting up the structure of what you will do later. After La Tante Claire I did a couple of years at Le Manoir (aux Quat’ Saisons.) That was fantastic. It was a bigger kitchen and I knew I had to get another level of education. There is a great French patissier there called Benoit Blin. He is a very talented guy, and I learnt a lot. Benoit was very instrumental in refining things. It was a different type of cooking, very light and elegant, very sharp and precise. Working for Raymond for a couple of years was great fun and took me to another level. CB: Well done for recognising that you still needed to learn. It is when a person thinks that their work is good enough and they can just get on with it that their works gets mediocre. WC: Yes, you have to be wary of stopping the development stage before you have enough in your armoury. CB: And it sounds as though you had some mentors who were very paternal towards you. WC: Yeah, it isn’t just about the cooking. I look back and I am very grateful for that. After Raymond I worked for Marco (Pierre White) for a couple of years, first at the Hyde Park Hotel, then at the Oak Room. He was very good to me. He was the first person who gave me a real wage. You worked six days a week there. There was such precision. If there is anyone who has done haute French cuisine to perfection, he did it. A young British boy making his way through the business as he did, he really changed the face of things. He knocked down the barriers. I admire him so much for that. White Heat is still one of my favourite books. I loved working for him. During that time I also won a scholarship to work for Marc Meneau at L’Esperance in France for about six months. I was totally obsessed with the whole Michelin thing still in my mid-twenties. Marc had three stars at that point. I did also travel to New York, Chicago and to Singapore to Raffles hotel. But I was very happy in London and decided that was where I wanted to be. CB: You went on to work at The Savoy, one of the ultimate London venues! WC: When the pastry chef job of the Savoy was becoming available, I went to see Anton Edelman, who loved the restaurant background that I had. I was the youngest guy ever to take that job, I was 27, 28, and he must have had reservations. But Anton was so kind to me. At a restaurant you have lunch and dinner service. At the Savoy it just keeps on rolling, it never ends. You have lunch, you have tea, you have dinner, you have midnight snacks, and you have bakers coming in at midnight. It never stopped, it was like a drug, and I couldn’t stop running it. I put everything into it, for about three and a half years. So Anton got me this tiny little room, there were a few staff rooms on the 7th or 8th floor that looked right out on to the Thames. I don’t think you were meant to stay there every night, but I did. I remember the Millennium celebrations, at about 11pm when the fireworks went off, hanging on to this tiny ledge out of my window with most of the pastry team. Underneath us were people who had paid thousands of pounds, and our view was better than theirs! I thought to myself, this is the life. And of course I met my wife Suzue at the Savoy. 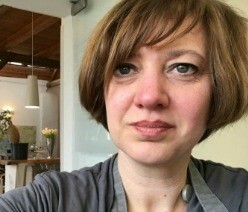 CB: She is a pastry chef too. She was in charge of afternoon teas wasn’t she? WC: Yes, I say that I used to be her boss, but now she is my boss. There is no hotel, in the UK if not the world, like it. But I knew that it was my last job in someone else’s kitchen. A lot of people would go from there to another hotel. I wanted to be my own boss. CB: Even as head pastry chef somewhere like the Savoy you have to march to someone else’s tune. WC: Now I do have the freedom to make what I want and build my own brand. 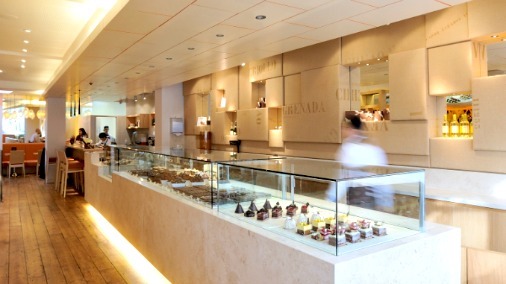 CB: If someone comes in here, to William Curley, they are seeking out what you do. WC: Yes, and there are a few of us who are trying to take it to a new level, to educate people about chocolate, to develop the market. So we have got to push the boundaries. There are still the more traditional things, but I am trying to push my craft out to another level, make it more interesting. 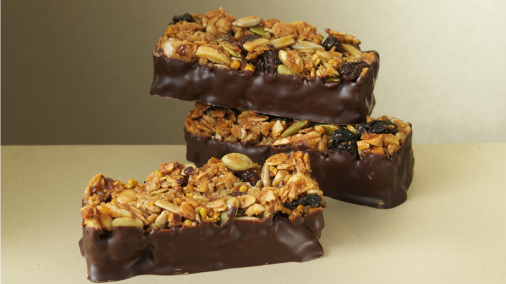 CB: What was the catalyst for you to get more involved in chocolate, because you still do a lot of pastry? WC: Yes I still do. Deep down, I opened the shop to make patisserie. People call me a chocolatier, but if you work in a patisserie section, chocolate is always part of what you do. I suppose, even at college, when it came to the exams, I would always end up choosing to do something with chocolate, I was always quite comfortable working with it. And when we opened in Richmond, bar maybe Artisan (du Chocolat), there weren’t really that many people trying to do chocolate high end. CB: So there was a space for chocolate to grow. WC: When I started cooking at Gleneagles the market was undeveloped. When we opened the shop in Richmond in 2004 the market was evolving massively, as was my knowledge. Since we have opened it has grown even more. It is a continuously growing market, which is very exciting. I couldn't choose, best have something now and take something for later too! CB: I wanted to ask you about Amedei, because your relationship with them is quite unusual. 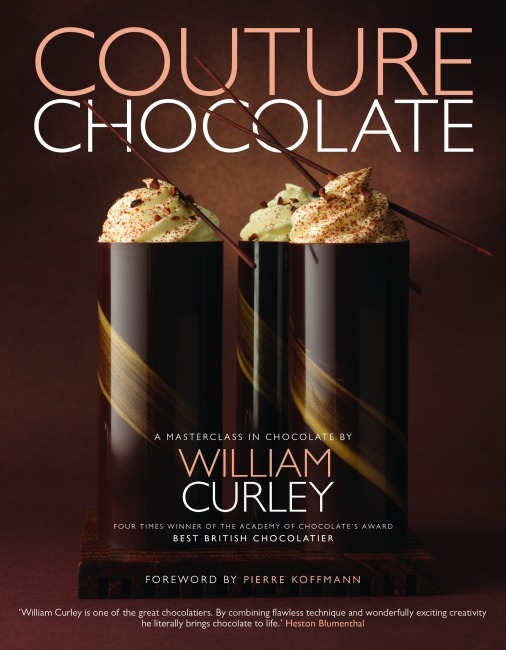 If you think about chocolatiers of your stature in the UK, they mostly use lots of different couvertures. I wondered how that came about, and what you get from it? WC: If you are a chocolatier in France you will probably do a deal with a chocolate house, whether it is Cacao Barry or Valrhona. From a commercial point of view it is probably not a bad idea. I think others may be right to be diverse on that front. But for me, Amedei makes the best chocolate in the world. Consistently, every time I get it I just think this is phenomenal. I was using Valrhona up until ‘06/’07, and I used a little bit of Amedei. I had tasted Chuao and Porcelana and thought they were lovely chocolates. And I thought the Toscano range was good. But at some point, between ’05 and ’07 something massive happened, I don’t know what, and they took the Toscano range up to that same sort of level. CB: So you have formed a relationship with them. Are there enough different flavour profiles for your work? WC: I think so, they do one or two blends specifically for me, and I am sure they will increase their range over time. I want to work with the best ingredients, the best cream, the best butter, and the best chocolate. At the end of the day it is an ingredient, but chocolate is the main ingredient, it runs right down the heart of the business, so getting that right is fundamental. They make the best chocolate in the world, and I want to make the best chocolates in the world. CB: It might not suit everyone, but it suits you. In a way what is exciting is how much diversity there is amongst the top players in this. Your wife Suzue is Japanese, which appears to be a big influence on your work. It is your name above the door, how do you see that? WC: That is a good point, the business is very much both of us. 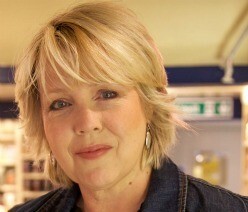 Sometimes it should even be more Suzue Curley that me. I think if we do another book it should certainly be William and Suzue Curley, for sure, because she puts as much in as I do. I guess when we opened in Richmond in ’04 we thought, call it William Curley, because there is the whole Michelin story, and the Savoy there, that people will get straight away, and maybe we can feed off that. We never really thought of the Japanese angle, and we have evolved massively in terms of the things we do. And the Japanese influence didn’t really come in there until ’06. Although I had been two or three times with Suzue, we had lived in a hotel. We would go to restaurants, but oddly Michelin starred French. WC: Aye, and then you would have the best French meal you have ever had in your life, in Japan! Which is kind of cool and funky, but missing the point. But in ’06 I lived in Osaka for a few weeks. I went to local restaurants, and the amount I absorbed from that is just phenomenal. Suzue is very much the inspiration. I guess I take the credit, but if it wasn’t for Suzue I don’t think we would be here. CB: In the flavours, you have your Scottish upbringing, and you have your French training. You have the classical, but also you are a young man who aspires to what is new and pushing the boundaries. And then Suzue is Japanese. You are marrying some of all these ideas and flavours in a way that makes sense. You are not pretending to make something Japanese. WC: Not at all, but the influence is there. CB: Your book recently won the Guild of Food Writer’s Cookery Book of the Year. Do you have any more plans for books? WC: Hopefully we will be doing a patisserie book in 2014. CB: How often do you put out new recipes in the shops? 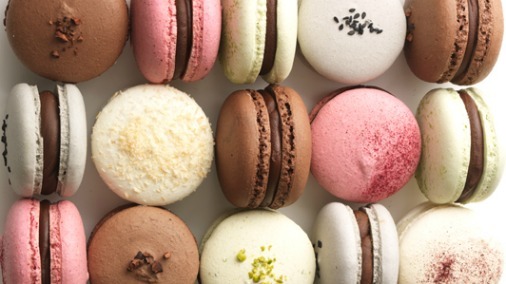 WC: I try and change three or four patisserie every couple of months, so seasonally. Chocolate is a bit more random, as some things are seasonal. We do change them, probably a couple of new chocolates every month. And we have got about 40 to 50 we have created over time, some of which revolve back in. CB: The thing about recipes, which I know well as I write a baking column, is that there is no point putting out recipes for the sake of it. You have to have something worth it. And equally, when you are running a business, there will be things that people always want to see here. WC: There are a lot of things you can’t change. There are things that people expect to be there, Jaffa cakes should always be there, we a do a millionaire’s shortbread, we have been doing a ‘picnic’ bar, that is cool, really tasty! Another thing that is important to me now professionally, probably the biggest and most important thing, is developing young people. I worked in places where people helped me develop and come through. It is my responsibility now. CB: What would your desert island chocolate be? WC: If someone said to me you are only going to get one chocolate for the rest of your life, I don’t think Porcelana from Amedei is beatable. It is the perfect chocolate, it ticks every box. My favourite chocolate that I make is Japanese Black Vinegar. It is pure; there is just a little touch of vinegar, with a Toscano 66%. If it was a cake I would have one of our Black Forests, and if it was a biscuit I would take a Millionaire’s Shortbread. WC: I do love what I do. I don’t think there can be a better job in the world than the cooking game. Food brings us together.